MONTREAL, QC. 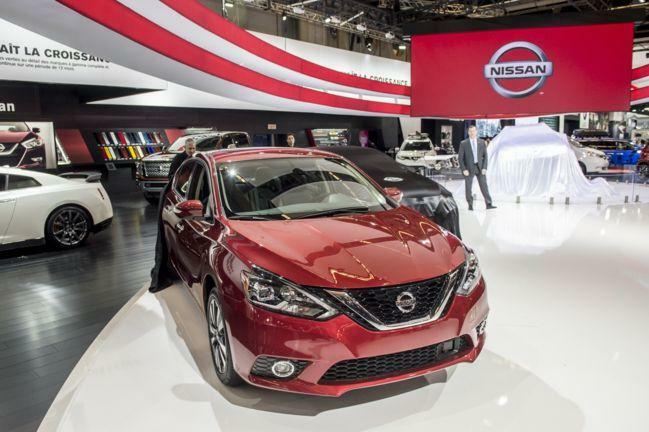 – Today at the Montreal International Auto Show the 2016 Nissan Sentra and 2016 Nissan Altima each made national debuts, showcasing the latest in Nissan's design language and safety technology. Nissan also took the wraps off of two surprise debuts related to its two top-sellers in Quebec – Rogue and Micra – both of which contributed to Nissan's 8.1 per cent market share in Quebec in 2015 (January-November). The Rogue Warrior - a stock Nissan Rogue fitted by Motorsports in Action (MIA) with heavy duty snow tracks - took the crowd by surprise when it was presented during the Nissan press conference. The Rogue Warrior's official driver, 2015 Micra Cup champion, Olivier Bédard, was also present for the unveiling of the new Micra Cup Limited Edition – a model replicating the look of the official Nissan Micra Cup race car. "The Montreal auto show presents the perfect opportunity to exhibit Nissan's new state-of-the-art technologies found on Altima and Sentra, while the Rogue Warrior proves the competency of Nissan's existing technologies, including Nissan's all-wheel drive (AWD) system and advanced Xtronic transmission," says Mike Soutter, Vice President Sales & Operations, Nissan Canada. "At Nissan, we like to push boundaries in the name of innovation and excitement. The Rogue Warrior and Micra Cup Limited Edition encapsulate that fearless spirit, demonstrating the capabilities of two of our most popular vehicles with the help of some extremely fun technical and visual modifications." Sentra has undergone a significant refreshing – starting with a revised exterior and the addition of an expanded suite of available safety and driving aid technologies. Altima, Nissan's best-selling vehicle in North America, has been redesigned for the 2016 model year, including new exterior and interior styling, enhanced technology and connectivity, a new Altima SR sports model (2.5) and new safety features such as segment-exclusive* Predictive Forward Collision Warning (PFCW). "In what is set to be the 'year of the sedan', Nissan has made major changes to its three best-known sedans – an all-new Maxima, a major makeover for Altima, and a redesigned Sentra," says Mike Soutter, Vice President Sales & Operations, Nissan Canada. "With the first Canadian auto show of the season comes the opportunity to set the stage for Canadian debuts, and this year show goers will be present for the unveiling of two new models – Sentra and Altima - reflecting the latest in Nissan's design language,and offering refreshed interiors and advanced safety and driving technologies." The Nissan display was a hub of excitement as the company, along with JD Promotion & Compétition, disclosed the 2016 race calendar for the Nissan Micra Cup. This year the series will expand to Ontario, growing to eight race weekends, with three of these happening in Ontario and five in Quebec. For the complete 2016 Micra Cup race calendar announcement, and for more information on the Micra Cup Limited Edition, please visit: http://nissannews.com/en-CA/nissan/canada/releases/nissan-announces-micra-cup-2016-calendar-and-reveals-a-micra-designed-for-the-fans. During the press conference at the Montreal International Auto Show, it was also announced that Total Canada has signed on as an official partner of the series for two years. After a successful season for the Total team in the Micra Cup, Total Canada will increase their participation through the partnership as the official provider of lubricant for the Micra Cup series. The Nissan Sentra compact sedan has achieved some impressive numbers over its more than 30 years and seven generations of production. In Canada, Sentra is Nissan's second best-selling vehicle, behind Rogue. And, since the introduction of the latest generation design in fall 2012, Sentra has experienced continuous growth in sales and market share year over year due to continuous product improvements, and contributes to the Nissan brand, the fastest-growing brand in Canada. Now, to help keep the momentum going for the 2016 model year, Sentra has undergone a significant refreshing – starting with a revised exterior and the addition of an expanded suite of available safety and driving aid technologies. The 2016 Altima offers a wide-ranging list of enhancements, including a refreshed exterior following the new Nissan "Energetic Flow" design language introduced on the all-new 2015 Murano and 2016 Maxima. The redesign offers a new lowered muscular front fascia, distinctive V-motion grille, new hood and fenders with tailored character lines, and available signature LED boomerang headlights and Daytime Running Lights. Named the "Rogue Warrior," Nissan's number one-selling product in Canada and also in Quebec, has been transformed into an extreme prototype. The Rogue Warrior sits on heavy-duty snow tracks measuring 30"/76 cm in height, 48"/122 cm in length and the individual track width is 15"/38 cm. Rogue Warrior is specifically designed to handle snowy conditions. It is capable of driving up to 100km/h, scaling a 45 degree grade in groomed snow, and has a ground clearance of 23"/58 cm. To learn more about the Rogue Warrior, visit: http://nissannews.com/en-CA/nissan/canada/releases/nissan-unleashes-a-warrior-in-the-face-of-canadian-winter. The 2016 Micra Cup Limited Edition is the perfect fusion between the Micra built for the street and the Micra Cup race car built for the track, and brings the dynamic look of an official spec series vehicle from the race track to public roads. This Micra Limited Edition is inspired by the official Nissan Micra Cup race car and sports a similar exterior appearance and 15'' 8 spoke, Micra Cup street edition wheels. Inside, this new model features a unique numbered plaque signed by Olivier Bédard, the first-ever Micra Cup champion! Only 250 units of the Micra Limited Edition will be produced - available through Nissan dealerships in early Spring 2016. To learn more about the Nissan Micra Cup, visit: http://nissannews.com/en-CA/nissan/canada/releases/nissan-announces-micra-cup-2016-calendar-and-reveals-a-micra-designed-for-the-fans.